As a business leader, you’ve got enough to worry about with your day-to-day operations that you don’t want to think about problems with your facility. However, it’s not uncommon for Sebastian, FL, companies to contend with leaking pipes or other matters that can lead to flooding and water damage. It’s important to identify the causes of these potential disasters and troubling incidents so you can prevent them and more effectively clean them up. In some cases, something such as a toilet backup or a slow leak in a pipe will only cause minor concerns in a bathroom or break room. However, if these things go undetected, you could face significant financial consequences or even potential interruptions to your business. 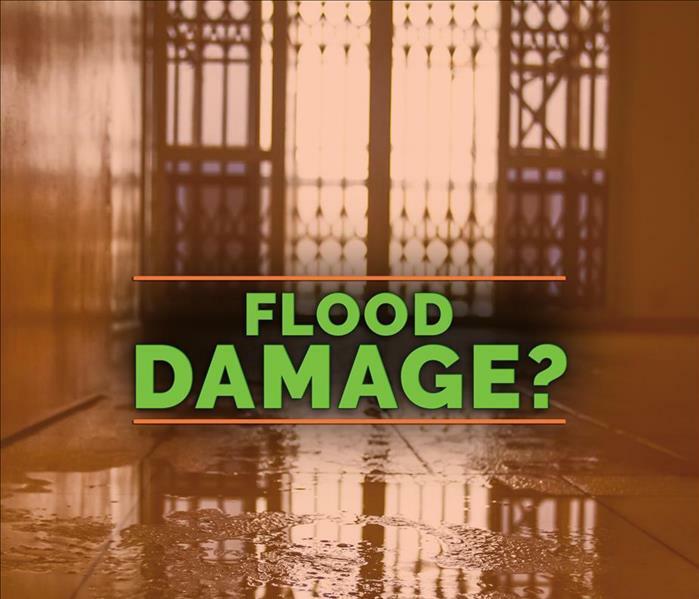 Flooding could damage or ruin the carpet, drywall, ceiling tile, furniture or electronics. 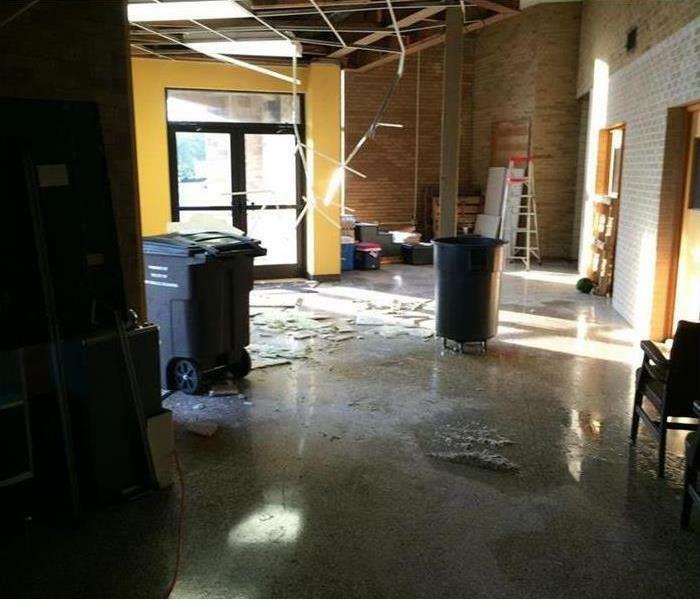 Water damage could create an unsafe environment for employees. Water damage may not be covered by your insurance. Leaking pipes could drip water onto floors or into the walls of your office over a long period of time without you even realizing it. Over the course of months or even years, this can rot away the drywall or subfloor. This problem could even encourage the growth of mold or other fungal development. If your building is aging, you may need to take a look at the plumbing system and make sure the pipes are still in good shape. 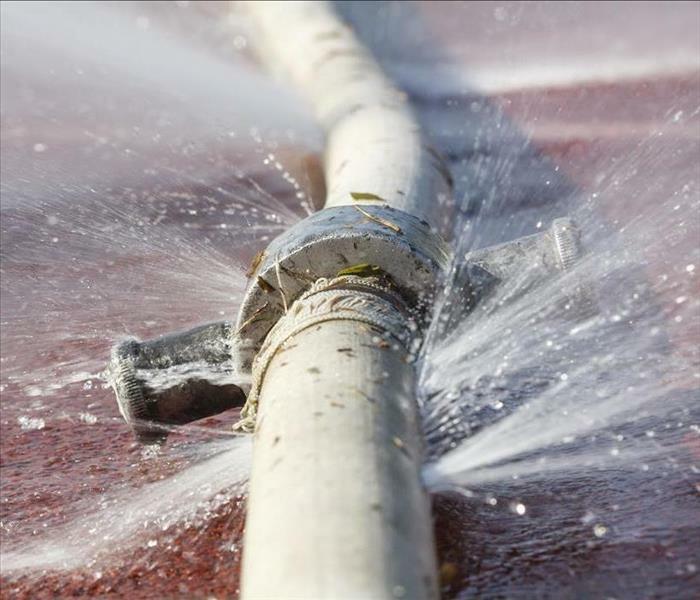 A pipe break could expel large amounts of water into your facility, which could result in significant flooding. Even if you react quickly to this incident, you could still face heavy costs and loss of equipment and supplies. A weak roof or poor foundation could be vulnerable if heavy rain hit during a thunderstorm. Leaking pipes will put water on your floor slowly, but severe weather could inundate you with too much to handle. If any of these events occur in your building, you know where to turn. Contact a commercial water damage specialist immediately. Mold: It’s a sight no one at work wants to see. The discovery of mold in your Palm Bay, FL, office can cause alarm with everyone. Not only this, but mold growth can result in heavy costs on your part, as your insurance may not cover some of the damages. Luckily, you don’t simply have to cross for your fingers and hope that fungal development won’t occur in your building after water damage or the discovery of other mold-friendly conditions. Here are four tried-and-true ways you can get proactive and work to prevent mold on your premises. Mold thrives in humid environments, so be aware of areas at work where the humidity levels may be on the high side. If you spot concerns, get a dehumidifier. Basements, attics and the areas under sinks are common culprits. Water damage is perhaps the most common source for mold trouble. After a heavy storm or pipe break, hire a competent water cleanup team to thoroughly remove the water and sanitize the area. Inspect your kitchens, break rooms and restrooms regularly. As soon as you spot trouble with pipes and faucets, especially persistent dripping and leaks, get the right people on the job to fix the issues. 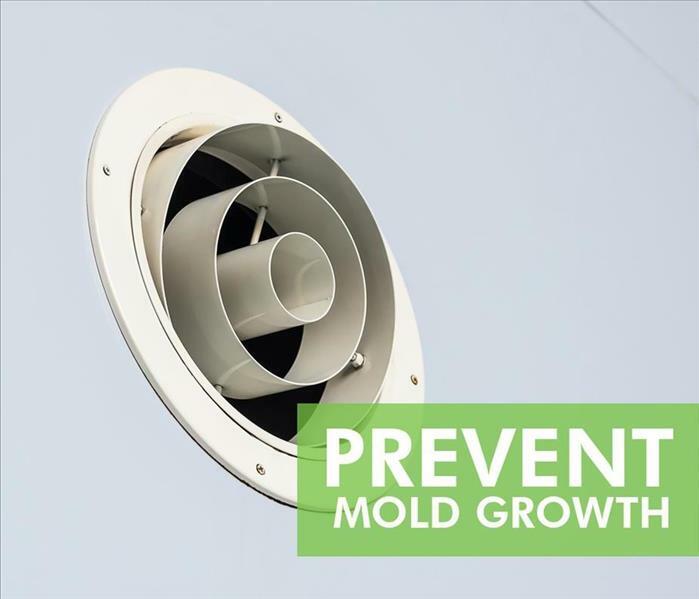 Mold prevention will be successful if your building has effective ventilation throughout all areas. This is especially important in kitchens or laundry areas. If you have these rooms in your building, ensure that you have functioning fans in them. Like any disaster or unforeseen incident, preventing mold may not be 100 percent possible, but you can significantly increase the likelihood that this unwanted invader will stay away from the premises. Don’t wait for water damage or other issues to spring you into action. Pay attention to all of these factors so you can keep mold away. Does Your Business Have a Plan? Will your business recover after a natural disaster? 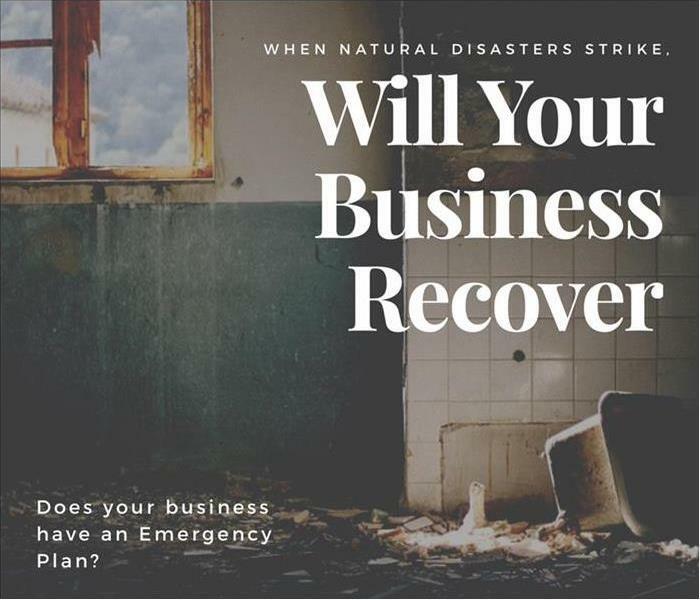 How quickly your company can get back to business after a hurricane, fire, or flood often depends on the emergency planning done beforehand. The regular occurrence of natural disaster demonstrates the importance of being prepared for any emergency. Only 50% of businesses never reopen following a disaster. While each situation is unique, your organization can be better prepared if you plan carefully, put emergency procedures in place and practice for all kinds of emergencies. Basic measures business owners and managers can take to begin preparing. Begin by identifying operations that are critical to survival and recovery. Then carefully assess your internal and external functions to determine which staff, material, procedures, and equipment are absolutely essential to keep the business operating. Understand what your policy does and does not cover. Check with your provider about things such as, physical losses, flood coverage, and business interruption. Inadequate coverage can lead to major financial loss. Communication with your employees is central before, during, and after a disaster. Be sure to share emergency information with your staff. The ability to evacuate workers and customers effectively can save lives. Establish evacuation producers and ensure your staff knows the route. Install exit signs, fire extinguishers, and smoke alarms and detectors in appropriate areas. By using anti-virus software, firewalls, and secure passwords, this will better protect your business’s data and information. SERVPRO of South Brevard is locally owned and operated so we are part of the Melbourne Beach, Florida community too. When you have a fire, flooding or water emergency, we’re already nearby and ready to help. SERVPRO of West Brevard and the National Preparedness Community is where we connect and collaborate on emergency preparedness. Use us to empower yourself to prepare and to coordinate preparedness activities with your family, neighbors, co-workers, and those with whom you may study or worship. We contribute what we can about what we know; ask for what we need; keep doing what is working; communicate about what is not working, and when possible, offer suggestions towards solutions. When we are connected and collaborate, we are more effective and efficient at educating and empowering ourselves to prepare for disasters and emergencies. America’s PrepareAthon! builds on this foundation by encouraging millions of Americans to focus on a simple, specific activity that will increase preparedness. America’s PrepareAthon!, a new national community-based campaign for action that focuses on increasing emergency preparedness through hazard-specific drills, group discussions and exercises. National PrepareAthon! Days are held every spring and fall. During National Preparedness Month we ask you, your family, community and workplace to take action by planning a National PrepareAthon! Day on or around September 30th. We recommend using digital media tools as a way to promote National Preparedness Month, September 1st-30th. 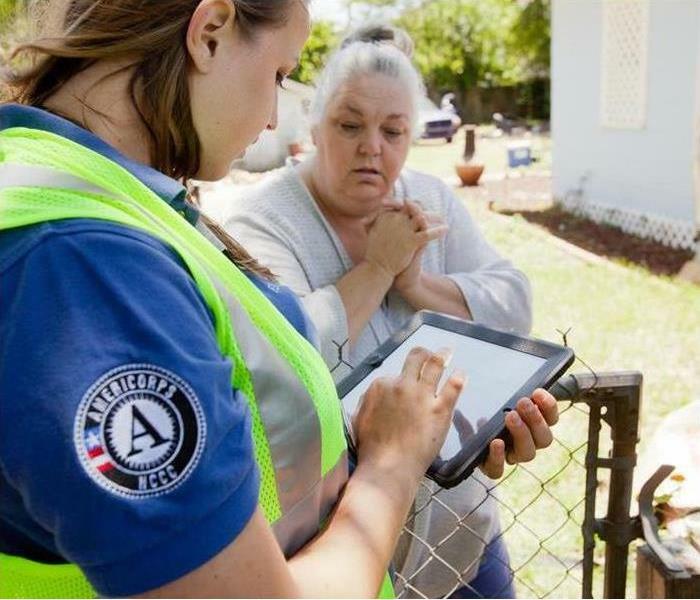 If you are in Melbourne, Palm Bay, Viera, West Melbourne, Malabar or anywhere in Flagler County and are in need of information on Disaster Assistance, please call us at (386) 447-2202 or see http://www.fema.gov/apply for help. When your clients have a flood, fire or storm damage their commercial property in Melbourne, FL, they often turn to you as a knowledgeable source of information on a reliable restoration company. You know that the always open, 24-hour availability of a service team is important in managing the restoration process and saving many of your client’s business items. Here are three ways a disaster remediation team can improve the mitigation procedure with a quick response. When the initial call is made, the disaster team must move quickly because decisions about the scene, water removal, and area restoration often require quick and comprehensive decisions. You want the restoration service to respond to your call as soon as possible, so that your clients don’t try to handle the job on their own and make matters worse. When you call a restoration company that offers an immediate on-site response with certified technicians, you know you can receive up-to-date status reports soon after their arrival. A fast response is important, but so is quickly mitigating the standing water at the disaster scene. Experienced restoration and remediation service personnel understand that there is a 24-hour window before mold and mildew often begin growing in the wet environment. Quick mitigation at the scene can help prevent the growth of mold. Once the water has been removed, restoration can begin. Repairing the area can be much less costly than removing and rebuilding, so it is vital to dry the area out quickly and begin the final site assessment to look for any further damage. You know your client depends on you, just as you depend on the quick response of the restoration team. Your toilet was built to last a long time, but it cannot last forever. Over time, the fixture may begin to work less efficiently and can break or develop cracks. If you have decided that it is time to replace the leaking toilet in your Port Malabar, FL home, here are some basic steps to help you get the job done. 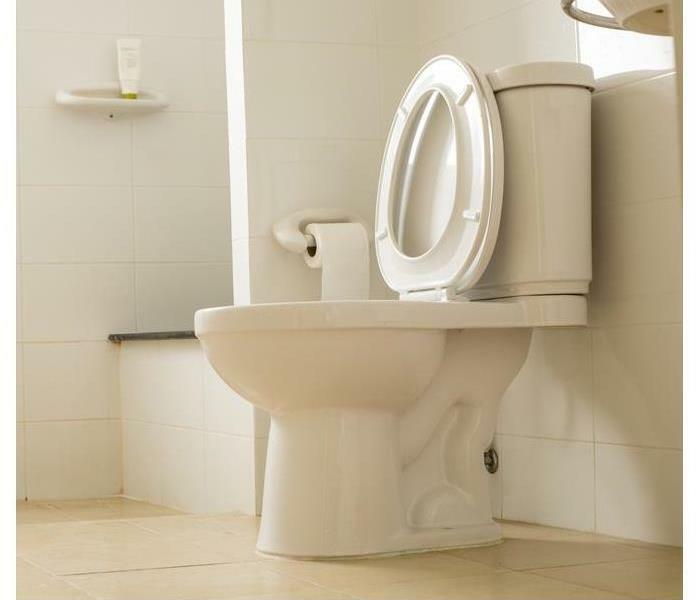 Before you begin any work on the toilet, you need to make sure that it is no longer connected to the water supply line. Drain as much water from the toilet as you can and dry the rest with a sponge or towel. This will prevent any messes during the removal. Once the leaking toilet has been dried, you can begin the process of removing it. You should unscrew any bolts that are securing it to the floor and then move the fixture back and forth gently to break the wax seal before moving the commode to another area. After the old toilet has been removed, you will need to clean up the area before you can install the new one. You should scrape off any wax that remains on the gasket and check that nothing has been damaged during the process. If everything looks fine, then you can proceed to the next step. If the leaking toilet has been removed successfully and there are no damages to the area that need to be repaired, you can begin the installation. Make sure that the toilet is placed correctly and is parallel to the wall behind it before securely tightening the bolts. Depending on your building code, you may need to seal the base with caulk. If you don’t feel confident replacing your toilet on your own, or if there is already damage in your bathroom, a water damage repair service might be able to help. They can make any necessary repairs and ensure that everything is installed correctly to prevent the need for future toilet overhauls. Showers combine all of the elements mold needs to thrive. Heat, moisture and organic material can support many types of shower mold. Take these three steps to prevent a shower from becoming moldy. Mold thrives in environments with limited air circulation. Ventilation promotes faster drying, which reduces residual moisture levels that support growth. Make sure the ventilation fan you install is rated for the square footage of a bathroom. Cleaning a shower can help to prevent shower mold from becoming a problem. Mold requires organic material for nutriment, and is less likely to grow if you regularly eliminate buildup from a shower. It can also be helpful to remove excess water from the walls or door of a shower with a squeegee. It is a good idea to clean and scrub shower surfaces at least once a week, scrub grout once or twice a month, and periodically treat the shower with a fungicide cleaner or a solution of one part bleach to nine parts water. Scrubbing grout is necessary to remove mildew or mold, but abrasion will also wear down the seal over time. When the grout between tiles or around the base of the shower wears out, this can lead to leaks that allow water to penetrate behind walls or spill out onto the floor of a bathroom. Check the condition of grout every few months and reseal when necessary. 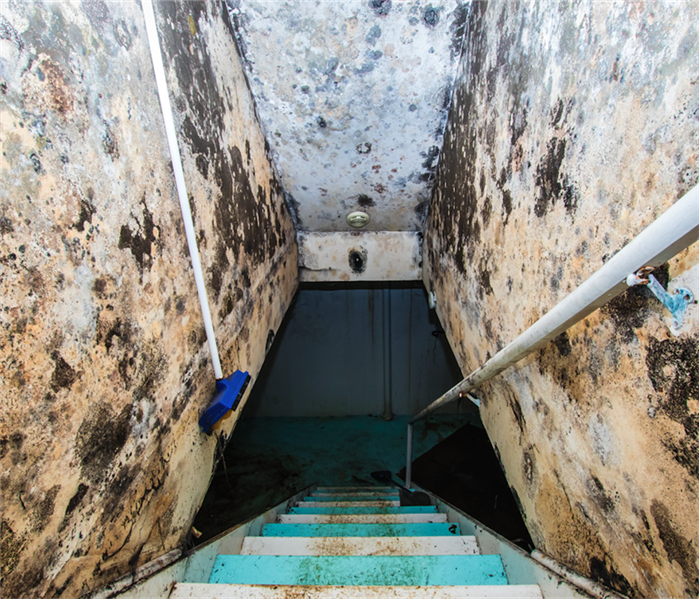 These three preventative measures can help to stop the growth of shower mold. If you can still smell a musty odor after taking these steps, water may be leaking behind tiles and collecting in wall cavities. Do not search for hidden mold on your own. Black mold may be present, and some species are toxigenic. Contact a service that offers mold testing and remediation in Eau Gallie, FL. Sometimes storm damage may be larger than predicted. 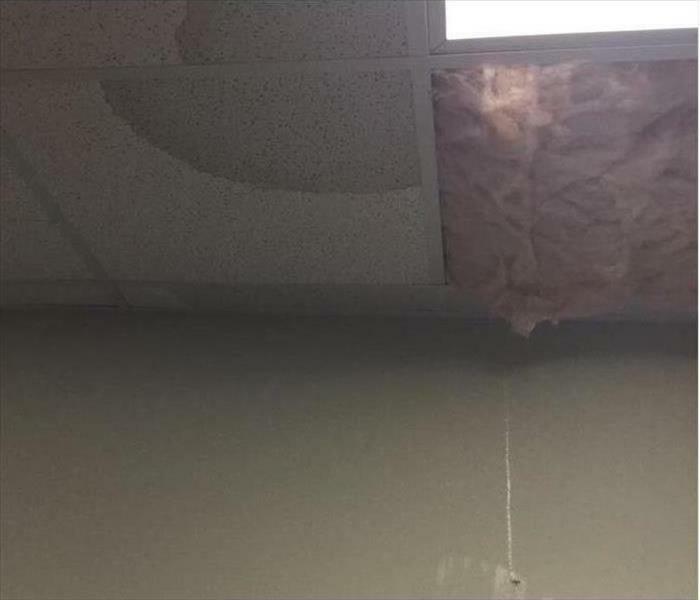 When this happens, you may want a team of restoration professionals who can respond to your client's needs quickly. Fortunately, SERVPRO is a locally owned and operated franchise capable of working together with other SERVPRO teams get the job done. However, as they are a franchise, they can call on corporate for additional resources as needed. When it comes to disaster recovery, you may want to know that you can get a quick storm response team to your clients. The faster damage can be protected and then repaired, the less likely additional damage may occur. The ability to get a team to the site in a timely manner may save time and money in the long run. SERVPRO has local offices around the country allowing them have professionals available at most locations. In the event of a large disaster it may be determined at large equipment is required to perform the job efficiently. A restoration team such as SERVPRO has access to the tools of the trade. This means that even in the case of a severe storm or major flooding, they can still begin restoration quickly. A professional restoration service may be able to with any disaster recovery needs your clients may have. They usually have the ability to mobilize several teams for larger than normal damages. This may also include a faster response time. A professional team they also have the resources, including tools and equipment, necessary to deal with large jobs. When a major storm event such as a hurricane is barreling towards your business, time is of the essence in preparing your commercial building. Flood water from heavy rains can cause tremendous damage to an unsecured structure and force you to close your doors for weeks or months while you undergo an extensive restoration process. Protect your business in Indialantic, FL, from the devastation of a storm by following a few simple guidelines to fortify your building. 1. Watch the weather. One of the most important steps in preventing a flooded building is also one of the simplest – pay attention to your local weather forecasts and take any severe weather or flash flooding alerts seriously. Use the advance warning to enact preventative measures like placing sandbags around the perimeter of your business and moving expensive electronic equipment to a higher level of the building. 2. Design an action plan. When a storm is about to hit, every staff member needs to have a specific role in preparing your business to withstand the destruction. Assign tasks to each team member so nobody gets overwhelmed. For example, one person should be in charge of fortifying the building to keep out flood water, another person should take care of backing up important electronic data, and someone else should supervise a final evacuation drill. 3. Prepare for restoration. Even a well-prepared business can sustain water damage if a storm is especially severe. That’s why it’s a good idea to have the contact information for a reputable commercial storm damage restoration company on hand in case you need professional assistance in the cleanup and repair process. Enlisting the help of an expert means you can reopen your doors faster than if you try to manage complex reconstruction yourself. A storm heading towards your commercial building means you need to take immediate action in preventing flood water from destroying your livelihood. By staying calm and taking steps to safeguard your building, you can ensure your business will ultimately withstand the destruction of a severe weather event. A house fire can be devastating and cause a lot of damage to your home. Along with fire damage, there are other types of damage that will require remediation as well. Here are a few things that you can expect if you experience a fire in your Sebastian, FL home. The most obvious and expected type of damage is that caused by fire. A fire can cause significant damage to your home and belongings. You may end up with shattered windows as well as missing walls and roofing. Furniture and objects may require repairs or replacing. 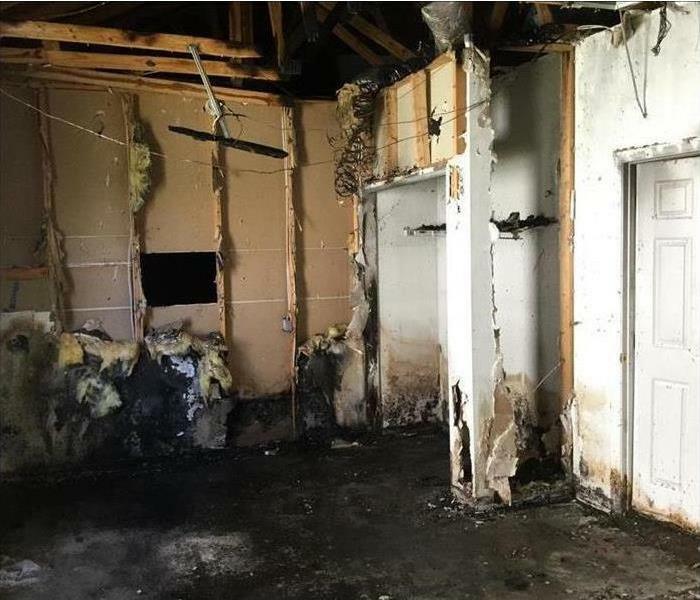 Water damage might not be something that you would usually think of during a fire, but depending on the severity of the blaze, you could end up with quite a bit of it. When firefighters use a fire hose to put out the flames, it can fill your home with a lot of water which can cause damage of its own. You can call a remediation service to remove the water from your home and perform any needed repairs. Even if the fire damage to your home is not extensive, you might have a lot of smoke damage that needs cleaning. Smoke can permeate your house and belongings even if the fire only affected a small area. Some evidence of smoke damage includes discolored walls or ceilings and a strong odor. If not removed properly, the smell of smoke can remain in your home for a long time after the fire occurred. There might be ash or soot present as well. Because there can be several different kinds of damage after a fire, it is important that you call an emergency restoration service as soon as you can. They can help repair the fire damage as well as any other damage your home has suffered. 4/8/2019 - Does Your Business Have a Plan?